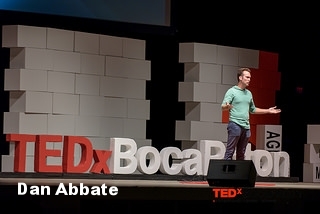 This year I had the opportunity to design and create the set for TEDx Boca Raton. 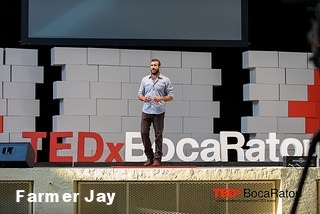 When I was approached naturally the usual factors needed to be studied: What's the theme? What's the branding? 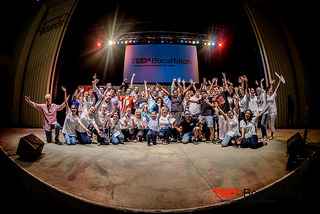 What does a TEDx audience look like in this area? 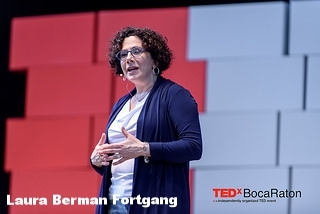 What are the TEDx rules/requirements? Venue? Stage dimensions? Set-up/Tear down Timing? Outdoor/Indoor? Lighting? Camera shots? Budget? Check, check, check.... Then I got thrown for a loop: "We were thinking about having a Flash Mob and maybe the flash mob could set up the stage at the beginning of the show? What do you think?" Two reactions went off in my head simultaneously: Having always wanted to participate in a flash mob, one was, "That would be soooooo Awesome! Yes! Let's do that!," while my more practical side thought, "You're FREAKING crazy!" Of course only the first one came out of my mouth, with the addendum, "Though in order to accomplish that, there MUST be rehearsals." So I set out to design a set that could be set and camera ready in five minutes in flash mob style that translated the theme and branding of the event which was Breaking Barriers. My perfectionist side would have to relinquish control of its setting to 12-16 VOLUNTEERS that I had never met before! We would have two rehearsals and one day of practice. Talk about Breaking Barriers! The branding of the event was a brick wall with an arrow breaking through. I used the broken wall theme of the branding and used large painted boxes as "bricks." The idea was that the red of TED was infiltrating the boxes and breaking up the wall. "Barrier" words taken from the speakers' talks (such as Age, Fear, Pesticides, Mind, Prejudice, etc.) would be scattered about the stage as if broken out of the wall. For the Flash mob, intricate choreography was not going to be an option. So I decided to do more of a body percussion/STOMP kind of feel. It consisted of three groups performing the body percussion and a drumline that carried on and amplified the beat while the stage was being set by the volunteers. One group of volunteers would set the stage. One group of professional dancers led by Gustavo Sumi, would pump up the crowd and the third group was part of the drumline group from Faith's Place Center for Education and would continue with more complicated layers of the body percussion. If you would like to give the body percussion a try, you can check out this practice video done by the amazing kids at Faith's Place under the fantastic leadership of Noble Mays and Anthony Barfield. I won't go through the countless challenges, iterations and adjustments that had to happen right up until we went live. There were in fact many, many times along the way that I thought the Flash Mob would have to be abandoned and the stage just set for the event. But I didn't want to do that because, a.) I knew it could work, and b.) we had a bunch of AMAZING volunteers that stepped up took a risk participating in this ambitious plan, listened, followed through and worked hard to make it happen and I didn't want to let them down! In the end we had only one and a half rehearsals, but through the great efforts and attitudes of our volunteers and Faith's Place Center, A LOT of communication and I'm sure some help from a higher power, the Flash Mob went off without a hitch! The crowd was pumped! It was a great start to a barrier breaking event! And to Faith's Place Center for Education. Noble Mays, Anthony Barfield and the rest of the staff at Faith's Place have done an amazing job teaching these kids music and to be great leaders. These kids did such an extraordinary and professional job. 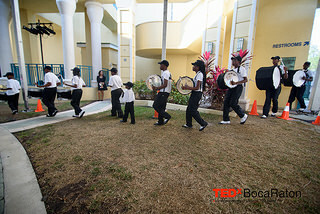 Because the event was on a Thursday and the kids had standardized testing that day, these kids literally got off the bus, put on their instruments and barely had time to take a breath before they performed their hearts out. They were fantastic! 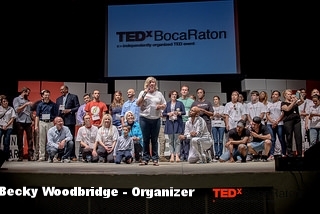 Finally I'd like to thank Becky Woodbridge, Brian Rensing and the rest of the team that put on TEDx Boca Raton 2015! I am grateful for this opportunity to participate in such a great event! I love working with "Why Not?" kind of people and figuring out how to reconcile why not with reality. It was such a great experience! Videos of the speakers' ideas worth sharing will be available online soon, but in the meantime, here are some glimpses of the event... Looking forward to next year!